I had read about the whole “Throwback” thing in a packaging magazine online a few months back, and it piqued my interest. 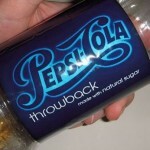 The article was basically a press release from Pepsico to let everyone know that they would be doing a limited release of Pepsi Throwback, Mt. Dew Throwback and Pepsi Natural. Well the Pepsi Natural really didn’t interest me, from it’s limited geographic release (10 major markets), to the “all natural ingredients”. Throwback on the other hand had me chomping at the bit to get some. Part of the interest being that the Throwbacks were going to be made with beet/cane sugar instead of high fructose corn syrup. Since Throwback was going to be a limited release, but with national distribution. I still didn’t have high hopes of getting any Throwback here in the styx. So I was at a Super Wal-mart a few weeks back doing some grocery shopping, while talking with my sis who was at a Whole Foods in Chicago at the time looking for Pepsi Natural. And we were both complaining about how neither of use could find Throwback or Natural. (Yeah I know, funny situation, two people talking to each other about finding food, while both are in different grocery stores in different states). Well at the Wal-mart right in the middle of the front check-out of the store, were two pallets of Pepsi Throwback and Mt. Dew Throwback. I so couldn’t believe it, that I walked past the display and had to do a double take. The price wasn’t too bad either, 20oz. plastic bottle for $1. So I got a Pepsi and a Mt. Dew to try them out. Well after a couple of days in the refrigerator chilling down, I finally got a chance to try out the Pepsi, and I’m impressed. With regular Pepsi I almost want to say that it has an acidic finish that is very distintive to Pepsi. But with the Throwback it was smooth all the way from start to finish, it was almost like it had a flatter flavor profile. 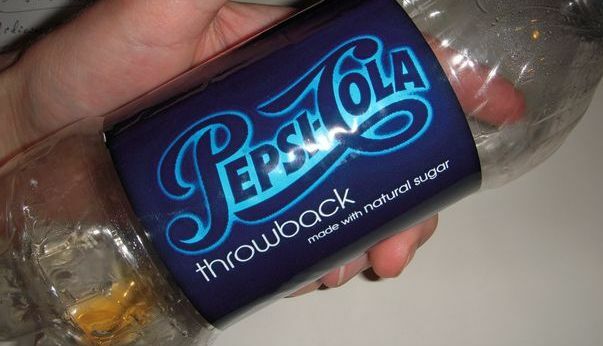 So that was a bit shocking from normal Pepsi, and a nice change of taste. So two thumbs up for me! As a Pepsi side note, there is just something about getting a Pepsi at Taco Bell, that just tastes awesome. I don’t know how they mix it at TB. It could be more carbination, or the syrup is diluted less in the post mix. But it just hits the spot. ..or the fastfoodworkers are too lazy to brix the machine and its WAY more sweeter than it should be..that is my theory. I didnt really care for the mt. dew..it actually tasted kinda artificial? weird I know. damn sugar tariffs screwing up my tastebuds to prefer high fructose crap!